The DUP is set to resume discussions with the British government on Monday ahead of an expected third Westminster vote. TAOISEACH LEO VARADKAR has said the Irish government will press on with a suite of support measures for businesses and farmers as Brexit day edges close. Speaking to reporters in Chicago, where he was marching in the St Patrick’s Day parade alongside MMA fighter Conor McGregor, the Taoiseach said he had a busy week ahead. President of the European Council Donald Tusk is going to be in Dublin for talks with the Taoiseach on Tuesday. Varadkar said the weekly Cabinet meeting will be held on Wednesday. “Obviously we are hoping that the deal will be ratified by the House of Commons before then but if its not we are ready. We have already passed the legislation to provide for a no-deal Brexit,” he said. The Taoiseach reiterated that the government is ready to deal with whatever may happen, but added that it won’t just be business as usual after Brexit. “We’ve protected the common travel area and this package will be there to supports incomes, to support jobs. It is not going to be a case of everything being alright. Brexit is bad news and a no-deal Brexit would be very bad news. “But the package of supports that we will put in place for hundreds of millions of euros and will support and protect incomes and jobs in those most exposed sectors, particularly in the agri-food sector and will also help other businesses and other exporters to be orientated away from the UK markets to other markets. And the country is in a good space to deal with this if we have to,” said Varadkar. A question mark now hangs over the DUP and what they are minded to do next week. Varadkar has said he believes the DUP do not want Britain to crash out of the EU. “I had a chance actually to meet with Arlene Foster yesterday in Washington DC so I got to hear her perspective and she heard mine,” he said. Varadkar and Foster both attended the Ireland Funds dinner on Wednesday evening in Washington. While Foster was seated on the table next to Varadkar, she was seen moving tables at the end of the evening and sitting next to the Taoiseach. She was also present for the St Patrick’s Day celebrations at the White House, as well as the Speakers lunch on Capitol Hill. “I certainly have the sense that the DUP would like the UK to leave the European Union with a deal, that they don’t want no deal either so at the moment they’re in discussions with the British government about how they might approach the next vote but they’re discussions that I’m not party to,” said Varadkar. The DUP is set to resume discussions with the British government on Monday ahead of an expected third Westminster vote on Theresa May’s Brexit deal next week. It is understood that a team led by deputy leader Nigel Dodds yesterday met a range of high-ranking Tories about the withdrawal agreement, with the discussions described as “constructive”. 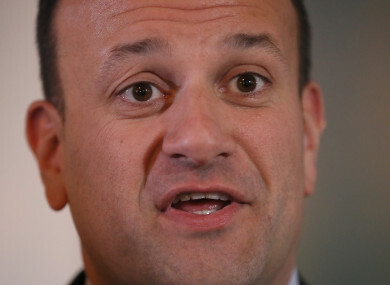 Varadkar has said that Ireland has always been open to an extension of Article 50, which push out the date for Brexit, but he told the media in Washington this week that an extension would have to have a “purpose”. Tánaiste Simon Coveney told France 24 news channel that he also does not want to see “rolling” deadlines for Brexit. He added that the Irish government “won’t be an obstacle” to an extension to the Brexit process, which Theresa May is expected to request next week at a meeting of EU leaders. Email “Taoiseach: 'It is not going to be a case of everything being alright. Brexit is bad news'”. Feedback on “Taoiseach: 'It is not going to be a case of everything being alright. Brexit is bad news'”.